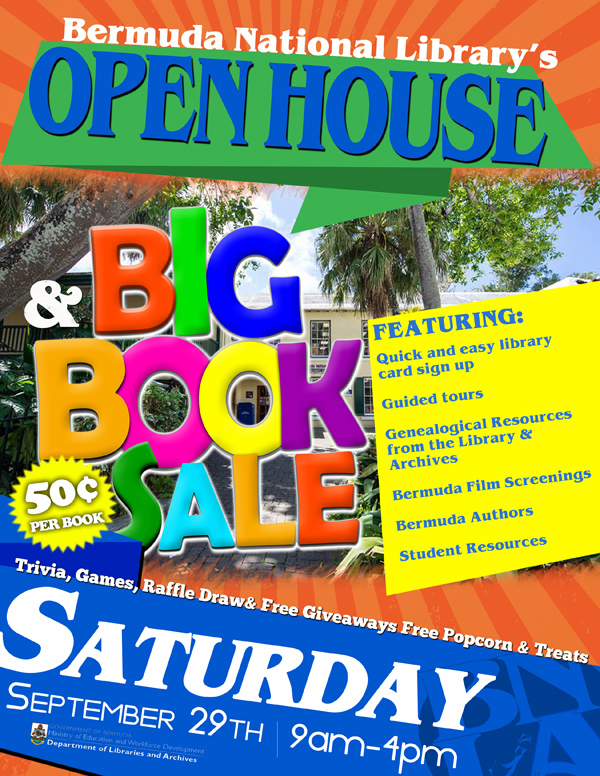 Bermuda National Library [BNL] is getting set to host Open House and 4th Annual Big Book Sale on Saturday, September 29 from 9.00am to 4.00pm. A spokesperson said, “We have some great things happening during Library Card Sign-up Month @ BNL! Join us for the BNL Open House and 4th Annual Big Book Sale on Saturday September 29 from 9am – 4pm! “Plan to stop by the Bermuda National Library [13 Queen St] to snag previously enjoyed books for 50 cents each! Enjoy free popcorn while browsing hundreds of titles from all genres. All proceeds of the book sale help to support our Friends of the Library. “We will have quick and easy library card sign up, guided tours, genealogical and World War II resources from the library and archives, film screenings, student resources and Bermuda Authors including Mrs. Carla George, author of, ‘Proverbs 31 Woman: More Than the Good Wife’. “Visit our various stations throughout the library for free giveaways and treats! Complete the trivia for a chance to enter our raffle draw!